Gwen Hinman shears sheep throughout New England, New York and the mid-Atlantic states, just as our father did. A full-grown sheep will produce about seven pounds of wool each year, which can make two adult-size sweaters. After the wool is “scoured” — or cleaned of all dirt, manure and other debris — it is ready to be carded and spun into yarn. 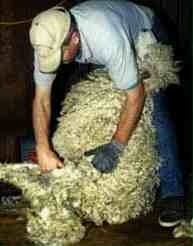 Sheep are sheared once or twice a year, depending on the breed and the reason for shearing. Some shepherds shear in the fall so they can fit more sheep in their barns during the winter — sheared sheep take up about a third less space than unsheared sheep. Others shear sheep before they lamb so it’s easier for the lambs to nurse and easier for the shepherd to care for the sheep. A sheared sheep’s wool quickly grows and provides a dense fleece to protect it from cold. In the summer, sheep are kept out of the hot sun for several days after shearing to protect them from sunburn while their wool grows in a bit. Quick and careful shearing causes little stress on the sheep. Do you have questions about shearing? Please call (603) 277-0616 or fill out the form below. The Shearer's Yarn · "No one knows wool like the shearer who shears the sheep."